Both bands brought flair and showmanship to the stage in their frontmen, as well as tightly crafted and captivating sounds from the group as a whole. 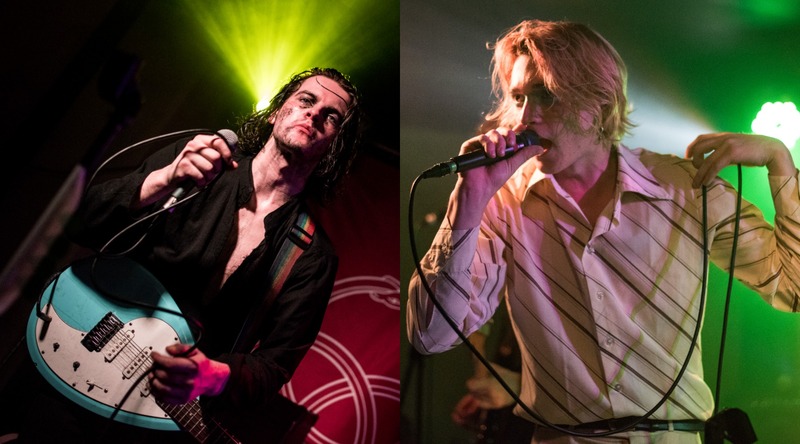 Whilst the heavens were opening, The Blinders gave an intense and powerful performance within the close quarters of a sold-out crowd at Heartbreakers. Second support band White Room’s alternative five-piece, led by exciting frontman Jake, ran through a wonderfully eclectic set that included new single ‘Shoot’ and the spooktacular ‘Cannibal Song’. Donning a fashionable suit and wielding a tambourine, as well as the groovy rose-tinted shades of the bassist and second vocalist, the group grabbed the attention of an audience destined for the heavier rock ‘n’ roll sound of The Blinders. They are definitely ones to watch, especially since they’re only from down the road in Brighton. White Room also helped their headliners out of a jam when they encountered technical issues with an amp, so everyone was made doubly grateful for their presence and performance. After a late start, The Blinders jumped straight in with some of their strongest tracks. ‘Gotta Get Through’, ‘L’Etat C’est Moi’ and ‘Brave New World’ set them up nicely for the rest of the evening, with everyone getting into a boisterous mood. The band were cool as cucumbers on stage, with bassist Charlie using one of the speakers to put a foot up and stare into the crowd to play his relentless bassline alongside Matty’s drums. This gave singer and guitarist Thomas, complete in black face paint, all the scope he needed to make some noise and spread the politically infused words from their dystopian debut album Colombia. The intense and atmospheric ambience they created added poignancy to the narration of songs like ‘Free The Slave’, which could have so easily fallen flat. Despite having to, to a certain extent, fiddle with the amp during the gig, Thomas still made time to venture into the crowd. They didn’t let anything affect the performance, which was further impacted by a rowdy audience member. Kudos to Charlie, who carried on the show with true courage and didn’t let it push him off the stage. Highlight for me had to be the energetic and infectious ‘Hate Song’, but their last number, which saw Thomas on the stage solo for ‘Orbit (Salmon of Alaska)’, had the audience gripped from start to finish, and spinning along to the lyrics “spin, spin, spin” (well, I was spinning). Acting as a nice cool down after the blistering show, it was a great way to end it all. All in all, both bands brought flair and showmanship to the stage in their frontmen, as well as tightly crafted and captivating sounds from the group as a whole. Check out the music video for ‘Brave New World’ below.